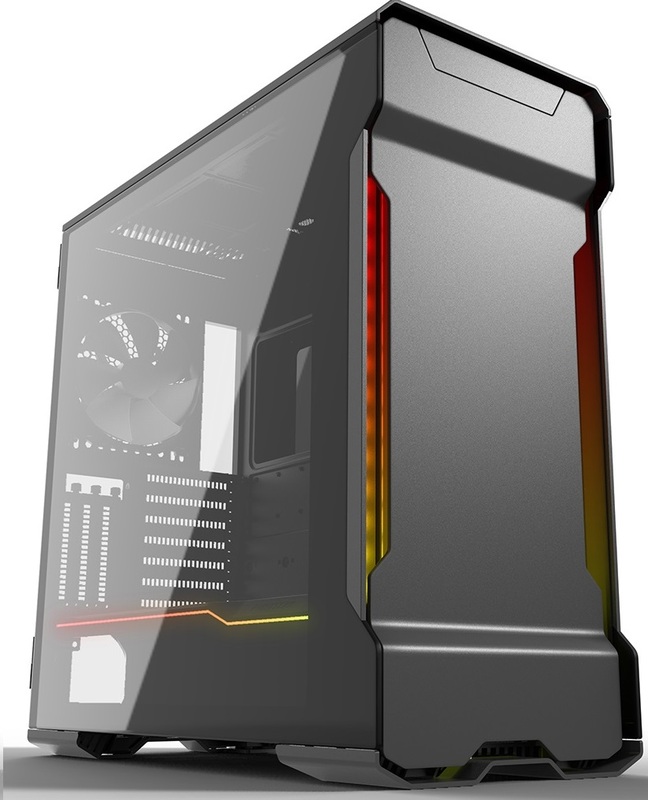 In the overall scheme of things, Phanteks hasn't been around nearly as long as the likes of Antec or Cooler Master, yet it's nudged its way to the cutting edge of case design and stayed there. The Enthoo Evolv X, in the company's own words, 'represents the next evolution' of its Evolv case. Externally, it doesn't look much different to your typical Evolv ATX, but the Evolv X has a tweaked design with new features and some that have been borrowed from others in Phanteks' range. If you own an Evolv ATX, you'll definitely notice some big changes too. Gone are the thumbscrews that hold the tempered glass side panels on, but the Evolv X isn't using ball-tipped pins to pop the new hinged panels in place either. Instead, behind the front door, which does pop-off, two plates are attached to the side panels at right angles and secured to the front of the case using thumb screws. There are positive and negative points to this. On the upside, apart from the hinges the panels are supremely clean with no screws or pins to spoil the view. The downside is that to open your side panels you'll need to remove the front panel to get at those thumbscrews, although we found the panels hold themselves in place fine without them if, like us, you tinker inside regularly. The front panel, which is hidden by a flip-down cover, includes the usual USB 3.0 ports and audio mini-jacks, buttons to control the RGB lighting on the right, and a centrally placed USB 3.1 Type-C port that will need to be powered by a proper USB 3.1 Gen 2 header on your motherboard - no messing around with USB 3.0 adaptors here; it's the real thing. You'll also notice those top vents, which are beefier than those on previous Evolv cases where airflow has been hampered, especially on the mini-ITX model. The case is still relatively compact compared to many ATX cases out there despite the feet adding a fair bit to the height. It's fairly even in terms of depth too, both measurements tipping the scales at 52cm. Underneath there's also a PSU dust cover along with rubber pads. Based on the fabulous Evolv X chassis, can the Eclipse P600S offer the same wow-factor for £80 less? The first case from new Phanteks-owned brand Metallic Gear gets put through its paces in our lab.